Ahoy! – said the cannon, because first impressions matter. 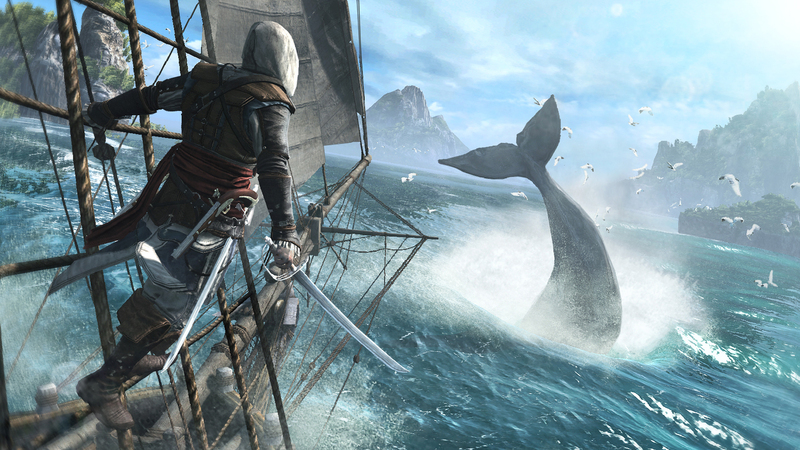 Wasting no time Assassin’s Creed 4 launches players into action, eschewing prelude and sci-fi babble that slowed the pace of the prior titles for more of what we really bought the game to do – fighting, naval combat, and exploring. The passive nature of the opening tutorial puts veterans and new players on even footing without hamstringing those already familiar with the controls, and weaves seamlessly into an engaging story about our hero – but is he a hero, or antihero? From the second your boots hit the sand, the open world nature of the game is as clear as the beautifully rendered water. With no shortage of distractions and secrets to uncover, the opening sequence plays at your pace – rewarding your taste for action, exploration, attention to detail, thirst for treasure, or all of the above. The movement, combat and stealth are tight and feel spot on. Finally, when the science behind the series does come into play, I found it to be a refreshing and clever break from the previous titles. Kudos to the writers, you now have my attention. Full review after the curtain, but for now color my expectations exceeded. This entry was posted in fun, gaming, online gaming and tagged ac 4, ac4, assassin's creed 4, fan review, xbox 360. Bookmark the permalink.